The grand daddy piece of economic data for financial junkies is the monthly jobs report which comes out the first Friday of every month. We received the data for the month of July this past Friday. We lost 131,000 jobs for the month, crushing the optimistic expectations. The good news you have probably read about was that the unemployment rate fell to 9.5% from 9.7% the previous month. 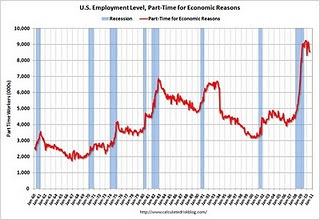 Why the drop in the unemployment rate when we lossed jobs? When Americans have been unemployed for so long that they have given up looking for a job, the government no longer counts them as part of the work force. Between June and July 381,000 thousand "left" the labor force. With only 131,000 jobs lost, this actually shows up as a decrease in the unemployment rate, hence the 9.5% print. The average duration of unemployment is now 34.2 weeks, and 44.9% have been out of a job for longer than 27 weeks. 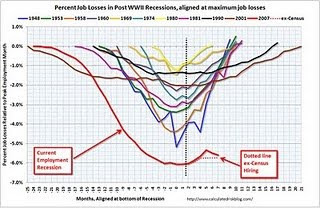 And finally, we can take a look at where this recession stands in comparison to others over the past century in regards to job losses and time to recover. The current depression is unprecedented. Fortunately Obama has recently extended the Emergency Unemployment Claims which provides Americans with over two years of government checks. With this free money coming in most will give up looking for work. This will help the unemployment rate moving forward as they drop out of the labor force. Another victory for the current administration.